Diagnostic Automation offers a One-Step Dengue NS1 RapiDip Insta Test to identify the dengue virus. This Dengue NS1 Rapid Test is an immunochromatographic strip assay for the qualitative detection of non-structural protein 1 (NS1) in human serum, and serves as an aid in the diagnosis of early Dengue infections. The Dengue NS1 rapid test will aid in the rapid diagnosis of Dengue virus in human serum even prior to the presence of IgM or IgG antibodies. Dengue is an acute viral disease, which is transmitted by Aedes aegypti mosquitoes. Dengue is characterized clinically by biphasic fever, rash and hematopoietic depression, and by constitutional symptoms such as malaise, arthralgia, myalgia and headache. Infrequently, more severe disease is seen, manifested by hemorrhage fever which may progress to lethal shock. It is endemic in the tropics and subtropics, worldwide, where an estimated 100,000,000 cases occur annually. It has been estimated that about 50 to 100 million cases of Dengue Fever (DF) occur every year with about 250,000 to 500,000 cases, of Dengue Hemorrhagic Fever (DHF). During 2002, more than 30 Latin American countries reported over 10,000,000 (DF) cases with large number of DHF cases. This has been followed by extensive epidemic of DHF in in several parts of India during 2003 through 2005. In the Americas, the reported incidence has more than tripled from 1996 to 2002.The incidence of Dengue outbreak has been reported in Hawaii, and in Laredo Texas. The potential for the virus to cause a severe disease has also resulted in the inclusion of this pathogen on the CDC Category A list for potential biological warfare and bioterrorism agents. The Dengue NS1 Rapid Test is a qualitative, membrane based immunoassay for the detection of NS1 antigen in human serum. The rapid test membrane is pre-coated with a NS1 specific antibody on the test line region and utilizes a separate control to assure assay flow and performance. During testing, the test sample is added directly to the sample region and the test is placed into a well containing 3 drops of buffer. The buffer and serum mix and interact with NS1-specific monoclonal antibodies conjugated to gold nanoparticles. The solution migrates upward on the membrane to react with the anti-NS1 antibody on the membrane. If NS1 antigen is present, a red line will appear at the test line. For additional details please refer to the instructions for use. 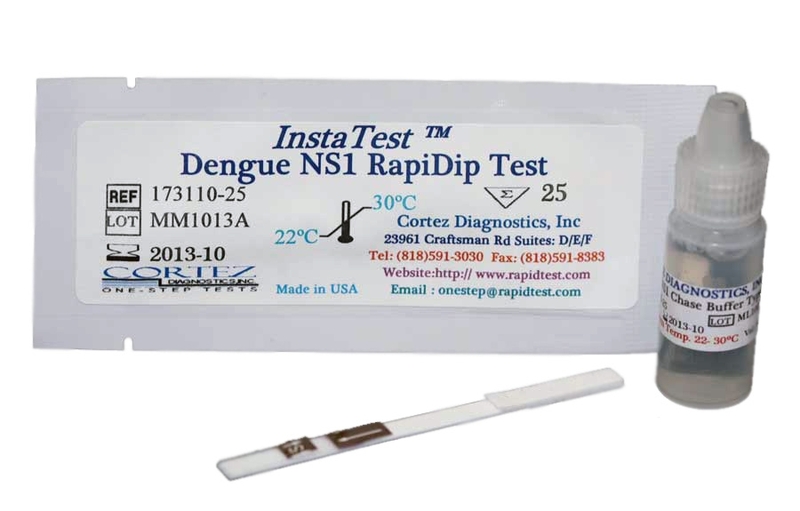 See Dengue NS1 Rapid Test Product Insert for specific details on preparation, procedures, quality control, and interpretation of test results.